Penguins are flightless, aquatic birds, which live in the southern oceans in climates as varied as Antarctica and the Galapagos Islands on the equator. There are seventeen species in all but the African Penguin is the only one to inhabit the African continent and its inshore islands. It used to be known as the Jackass Penguin, on account of the braying sounds which it makes on land, but the name 'African Penguin' has now been adopted to distinguish it from the Jackass Penguin found in South America, which is slightly different in appearance and behaviour. Another name that is occasionally used is the Blackfooted Penguin. The closest relatives of the African penguin are, in fact, the Humboldt and Magellanic penguins of South America and the Galapagos penguins of the Galapagos Islands off the coast of Ecuador. Penguins are ancient birds, probably evolving about 65 million years ago, at the time that dinosaurs became extinct. Since penguins are well adapted to the cold, the South American and African penguins feel the heat on land and have evolved various ways to cope with the sun. 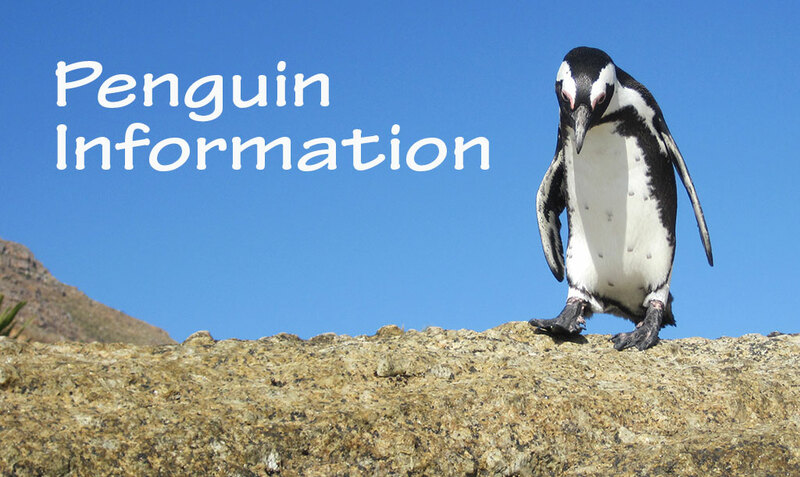 African penguins have a black stripe curving across the top of the chest. They are insulated by air trapped between their feathers. This makes the birds extremely vulnerable when they are moulting, which they do annually, and for this period of about three weeks (at Boulders about November) they are land-bound, getting thinner and more bedraggled until the moulting process is completed. Before moulting they eat hugely and put on about 30% more fat. Moulting takes about three weeks, during which their weight almost halves. Although the African penguins are quaintly clumsy on land, and ungraceful emerging from the water, in the sea they are extremely skilful swimmers, reputedly reaching speeds of 24 kilometres (15 miles) per hour. Rather than using their feet to swim, as many aquatic birds do, they use their wings that have been modified to form extremely efficient flippers. Their webbed feet are used mainly when swimming on the surface of the water. Their feathers have become very small and waterproofed, overlapping to provide better insulation. The African and South American penguins have shorter feathers than the Antarctic birds, since they do not face such great cold. Penguins also have heavier bones than most birds to enable them to dive. African penguins live an average of 10 to 11 years but sometimes reach as much as 24 years. African penguins inhabit twenty-seven sites. Most are on inshore islands, of which the best known is Robben Island. There are only three of them on the mainland sites. The largest existing colony is on St Croix island near Port Elizabeth, with about 50 000 birds. Dassen Island off Yzerfontein, once home to over a million penguins, now has about 30 000, while Dyer Island near Gansbaai has about 20 000. The most remarkable of the mainland colonies is Boulders Beach in Simon's Town with over 2500 birds. African penguins feed mainly on small pelagic fish (fish which swim on the upper layers of the open ocean) like pilchards, anchovies, horse mackerel and herrings. Competition with commercial fishing has forced them to adapt their diet. They now also eat squid and small crustaceans as well. Since penguins are capable of diving considerable depths, up to 35 metres, remaining under water for 1.5 minutes, they can reach fish that other birds cannot. Sometimes they travel considerable distances to feed, up to 30-70 kilometres, although they have been known to travel over 200 kilometres. Particularly when they are feeding demanding older chicks, penguins will spend much of their days at sea feeding. On average a penguin will eat about 300 g of fish a day, although this will increase to over 1 kg before moulting or when feeding older chicks. There is little distinction between male and female African penguins, although the male is slightly larger and has a longer bill than the female. Penguins are usually about 4 years old when they begin breeding. African penguins will remain with a single partner for many years, producing one or two eggs a year. They only separate normally if breeding has failed for some reason. They can breed at any time of the year, but the Boulders population tends to breed in March to May. The incubation period lasts forty days, and the fledging period from 60 to 130 days. Young penguins have blue-grey backs and white fronts, without the black and white markings of their parents. Originally the African penguin nested in guano (hardened bird droppings, in the past several metres thick) but when this was mined for fertiliser in the nineteenth century they were forced to adapt to other conditions. Now they nest in crude shallow burrows dug out of the sand or under beach vegetation. The main reason for digging burrows is to protect the eggs and chicks from the heat of the sun. Antarctic penguins do not do this. Penguins prefer to return to the same nesting site every year and will persevere most determinedly to get back to their old nests. At Boulders they have been known to climb over the fence that was erected to prevent them from spreading inland. Incubation of the eggs lasts for about forty days. When the babies hatch, they are already covered in a layer of gray fluffy feathers which provide them with insulation and waterproofing. The parents share the nesting and feeding duties. While one partner stays behind, without food or water, for about two and a half days, the hunting partner will swim as much as ten miles out to sea to find tasty food. The babies are usually fed in the late afternoon. The parents regurgitate partially-digested fish into their mouths. Parents continue to keep close watch on their chicks for about a month and the chicks leave the nest after about two months. This can take much longer, however, if the parents have not been able to supply them with enough food. Going to sea is the most hazardous time of a fledgling's life - only about half the birds that go out for the first time return home. At this stage remain at sea for many months and only return home for their first moult. Young penguins continue to stay out at sea for long periods, sometimes travelling great distances. Only in their 3rd to 4th years do they come back to their homes to mate for the first time. At Boulders the penguins are relatively safe although cats and dogs have attacked them. One of the greatest problems now is that they like to stand under warm cars and several have been run over. In 1983 a pair of African penguins were spotted on Foxy Beach at Boulders and in 1985 they began to lay. Since then the colony has grown rapidly, increasing initially at about 60% a year. By 1997 there were 2350 adult birds. Such a quick growth of the colony was the result of immigration, particularly from Dyer Island, as well as by reproduction. Birds have probably come to False Bay because of the good fishing available since commercial purse seine fishing has been banned in the Bay. Although Simon's Town is very proud of its penguins, nearby residents suffered badly as the birds invaded their gardens, destroyed the undergrowth and were generally very noisy and messy. The great increase in tourists has also been a problem. As a result, the area has now been taken over by Cape Peninsula National Park, the birds have been restrained from wandering inland by a fence, board walks and an information room have all been established. Boulders still remains the only place in the world where one can actually swim amongst the penguins as they have continued to invade more beaches. They are remarkably untroubled by people but one should avoid harassing them by getting too close or chasing them. Beware!! They have a vicious bite. Because they live so far north, and in a relatively accessible region, African penguins have been particularly vulnerable to human depredation. From the time of time of the first Dutch settlement at the Cape in 1652 penguins were an invaluable addition to the settlers' food supply. Penguin eggs have also been regarded as a delicacy and were sold and eaten well into the twentieth century. In more recent times the decline in food supply has forced penguins to adapt their eating habits. Seals, which used to share the same small fish, now increasingly prey on the penguins instead. Oil spills from tankers are also a hazard since the oil clinging to their feathers affects their insulation. As a result of all this, there has been a serious reduction in their numbers, and African penguins are now regarded as an endangered species. There were several million African penguins in the nineteenth century. In 1930 there were still over a million birds but there are now only about 179 000 left. All the penguin breeding sites are now protected. At Betty's Bay, another mainland site, a fence has been erected to prevent disturbance from people and predators. January : Juveniles moulting and adults feeding up for breeding season. February To August : Breeding season. September To October : Penguins at sea, feeding up for moulting. November To December : Moulting season.